Fill their heart with delicious chocolates by presenting your love with this Engraved Candy Jar. 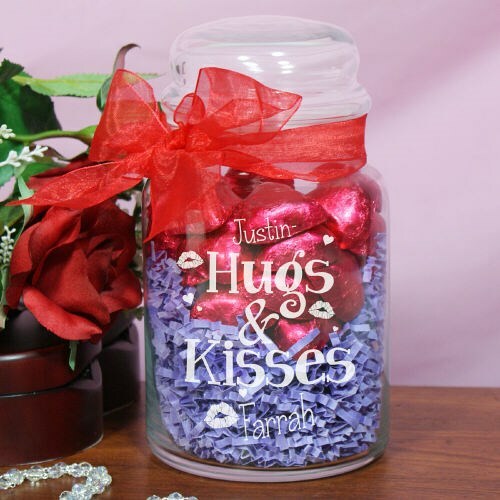 Your personalized Hugs & Kisses Treat Jar makes a thoughtful and personal way to show how much they mean to you. Perfect for Valentine’s Day or any romantic occasion that you see fit. We fill the jar with a 1/2 pound or approx. 25 delicious, mouth watering Chocolate Hearts individually wrapped in Valentine colored foil. Your Engraved Sweet Treat Glass Jar measures 5.5" h x 4" w and holds 31 oz. Each glass jar comes with an air-tight glass lid. Includes FREE Engraving. Personalize your Valentine's Day Treat Glass Jar with any name or title on top of design and any name at the bottom. Additional Details 800Bear.com has a vast selection of Personalized Valentine's day Gifts that is sure to stir the heart with romance, love and joy. Shop 800Bear.com for all of your Romantic Gifts today. Be sure to also take a peek at our Engraved Initials Bud Vase with a Teddy Bear Hugger and our Personalized I Love You T-Shirt as well.